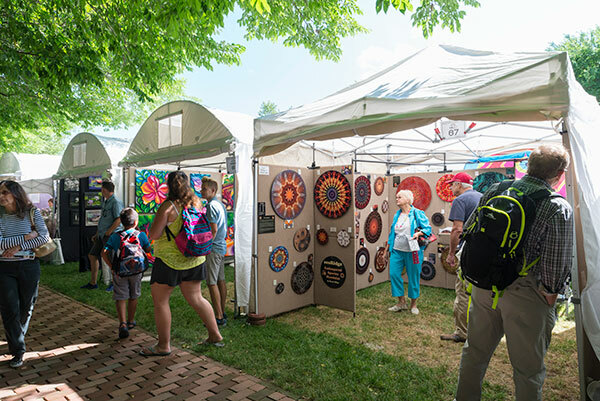 Stroll and shop among 90 juried artists on the Esplanade. Public Preview: Friday, July 5, 4 to 7 p.m.
Stroll and shop among 90 juried artists on the Esplanade. This one-of-a-kind art festival brings botanic-themed and botanic-made photography, paintings, ceramics, cement, metal, fiber, wood, jewelry, and other pieces to the Chicago Botanic Garden. Find remarkable items to purchase or just admire them during your visit to this annual event. No admission fee. Regular parking fees apply. Free parking every day of the year for Garden members. Please direct vendor inquiries to amdurproductions.com. View masters at work with interactive art demos and booth chats taking place all weekend long. A full listing of artists appearing at this event can be found at Amdur Productions' website. Click here to view artist information.